Combine electrochemistry and spectroscopy (VIS-UV, RAMAN) in one measurement with one instrument. Useful equipments for combined electrochemical and optical analysis, they can be used with our screen-printed electrodes or with any other conventional electrode. An integrated solution consisting of a bipotentiostat/galvanostat combined with a spectrometer and a light source- laser for RAMAN measurements or Deuterium/Halogen lamps for VIS-UV measurements-. The NEW DropView SPELEC Software is the powerful spectroelectrochemical software tool that controls the equipments, allowing perfect experiment synchronization and superior performance in terms of data treatment, including functions such as combined experimental control, real time spectra display, advanced file handling of electrochemical and optical measurements, among many others. SPELEC NIR is the world's only equipment in the market for performing NIR SPECTROELECTROCHEMISTRY studies combining in only one box a Light source (VIS-NIR: 360-2500 nm Tungsten halogen) a Bipotentiostat/Galvanostat (±4 V potential range, ± 40 mA current range) and a Spectrometer (Wavelength range: 900-2200 nm). All the components are perfectly fitted and synchronized, offering for the first time a fully integrated synchronized NIR spectroelectrochemical instrument. 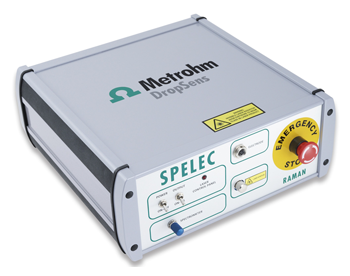 SPELEC RAMAN is the world's only equipment in the market for performing RAMAN SPECTROELECTROCHEMISTRY studies combining in only one box a LASER Class 3B (785 nm), a Bipotentiostat/Galvanostat (±4 V potential range, ± 40 mA current range) and a spectrometer (wavelngth range 785 – 1010 nm and Raman shift 0-2850 cm -1). All the components are perfectly fitted and synchronized, offering for the first time a fully integrated synchronized Raman spectroelectrochemical instrument. SPELEC is the world's only equipment in the market for performing SPECTROELECTROCHEMISTRY studies combining in only one box a Lightsource (UV-VIS-NIR wavelength range: 215-400 nm Deuterium, 360-2500 nm Tungsten halogen), a Bipotentiostat/Galvanostat (± 4 V DC potential range, ± 40 mA maximum measurable current) and a Spectrometer UV-VIS wavelength range: 200-900 nm (ref. SPELEC) or VIS-NIR wavelength range: 350-1050 nm (ref. SPELEC1050). The NEW DropView SPELEC Software is the powerful spectroelectrochemical software tool that controls the equipment, allowing perfect experiment synchronization and superior performance in terms of data treatment, including functions such as combined experimental control, real time spectra display, advanced file handling of electrochemical and optical measurements, among many others. Black teflon reflection cell for performing Raman Spectroelectrochemistry with screen-printed electrodes in combination with ref. RAMANPROBE. Cell in Teflon suitable to perform transmission experiments with our transparent Screen-printed electrodes in combination with a collimator lens (ref. CLENS). Dimensions: 3.3 x 6.0 x 3.3 cm (Lenght x Width x Height). Quartz cuvette with platinum grid working electrode, platinum counter and Ag/AgCl reference electrodes for performing spectroelectrochemical measurements in bulk. A complete system for transmission analysis of electrochemical reaction taking place in solution. It is compatible with standard spectrometers and holders. Cell in Teflon suitable to perform reflection experiments with our Screen-printed electrodes. In order to allow researchers to perform spectroelectrochemistry studies in a flow system, we have developed a smart solution consisting in the combination of our TLFCL-CIR screen-printed electrodes and a special cell accessory, ref. TLFCL-REFLECELL, which incorporates a convenient hole for perfectly fitting our optical fiber ref. RPROBE-VIS-UV, thus getting an easy set-up for reflection experiments. Reflection probe designed to be used with a single excitation 785 nm wavelength (up to 500 mW). Suitable to work with our Raman Cell for Screen-Printed Electrodes or with any conventional RAMAN Set-up. Transmission fiber VIS-UV designed to perform transmission experiments suitable to work with our Transmission Cell for transparent Screen-printed electrodes or with any conventional cell. Reflection probe VIS-UV designed to perform reflection experiments suitable to work with our Reflection Cell for our Screen-printed electrodes or with any conventional cell. Collimator lens suitable to work with our Transmission Cell for transparent Screen-printed electrodes or with any conventional cell. LED light of different wavelengths depending on the range of interest for performing fluorescence spectroscopy experiments coupled to spectroelectrochemistry. Accessories required to perform fluorescence spectroscopy experiments coupled to spectroelectrochemistry with Screen-Printed Electrodes. 4-way cuvette holder designed to perform absorbance and fluorescence measurements with liquid samples. Suitable to work with our spectroelectrochemical equipments (refs. SPELEC and SPELEC1050) or with any other conventional spectrometers. These disposable PEDOT Electrodes (ref.P10) made in a plastic substrate are based of a PEDOT Working Electrode with a Carbon Counter Electrode and a Silver reference electrode. Specially designed for ElectroChemiLuminiscence or Spectroelectrochemical applications. Dimensions: 33 x 10 x 0.175 cm (Length x Width x Height). These disposable ITO Electrodes (ref.ITO10) made in a plastic substrate are based of a ITO Working Electrode with a Carbon Counter Electrode and a Silver reference electrode. Specially designed for Spectroelectrochemical applications. Screen-printed electrodes on a transparent plastic substrate with a thin layer gold working electrode deposited by sputtering process. The thin layer provide enough transparency and a very flat surface is achieved. Gold working electrode (4 mm diameter), gold counter electrode and silver reference electrode system ideal for working with low volume of sample. Disposable Carbon Optically Transparent electrodes (ref. COTE10) made in a plastic transparent substrate with a working electrode of Single Walled Carbon Nanotubes (SWCNTs). This thin layer working electrode is combined with screen-printed carbon auxiliary and silver reference electrodes, ideal for performing spectroelectrochemical experiments. Dimensions: 33 x 10 x 0.175 mm. Mix of transparent working electrodes with different electrode materials: PEDOT (ref. P10), ITO (ref. ITO10), Gold (ref. AUTR10) and Single-Walled Carbon Nanotubes (ref. COTE10). Check the different performances of these references previously developing your spectroelectrochemical experiments.